The Pioneer is a circular steel campfire cooking grill that can be assembled quickly and easily to go straight over your campfire. The 18" (46cm) diameter grill is big enough to cook for friends and family and has a unique raised edge to prevent your food from falling into the fire during cooking. 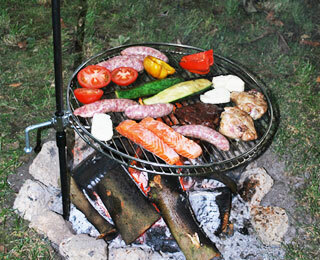 The cooking grill connects to a sturdy upright stake (36" (92cm) total length, ¾" (2cm) diameter) that is driven into the ground. The unique screw bolt fitting on the grill allows you to adjust the height of it over the fire and also to rotate it away from the flames for ease of turning and serving food, or when putting more wood onto the campfire. All grills will be dispatched as quickly as possible. Express delivery options are available but these will increase the P&P costs - please contact: sarah@campfirecookinggrill.co.uk » for details. The Rebel can be used with charcoal or with a campfire. The two-piece stake, 10"(25cm) x 12"(30cm) grill rack and charcoal pan all fit into the Rebel's own carrying bag. 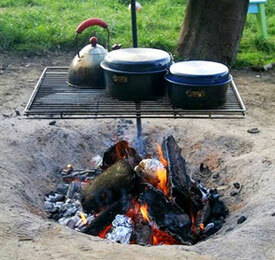 Load the charcoal pan with charcoal before packing and you will be ready to cook when you arrive at your campsite. Like all The Perfect CampfireGrills, the patented Rebel has the trademarked raised edge. Cleaning up the Rebel after grilling is easy. Be sure the hot charcoal has cooled and appropriately disposed of, or that the campfire is attended to and the grill has cooled adequately. 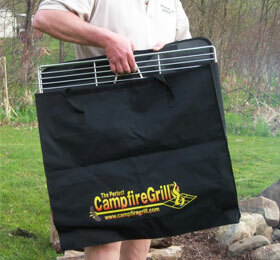 If you are not in a place where you can easily clean the grill, put it into the FREE carrying bag -- you can always clean it later! The Explorer is designed to be used in almost any setting. With its folding legs, it can be used at the beach, in rocky terrain, or at a more conventional campsite. 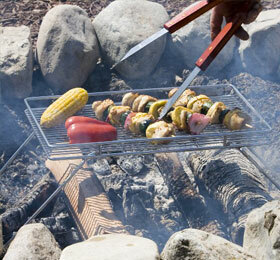 The 12"(30cm) x 18"(46cm) grill rack is big enough to cook for your backpacking party. At 1.5"(4cm) thick when folded, the Explorer fits nicely in its own carrying bag or a backpack. 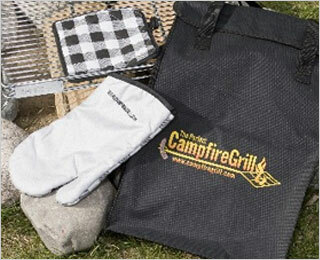 Like all of The Perfect CampfireGrills, the patented Explorer has the trademarked raised edge. The NEW Original, was designed for the larger family or group in mind but has the same simple design features seen with the Pioneer campfire cooking grill. The NEW Original has a larger square steel grilling surface 20"x 25" (51cm x 64cm) and comes with sturdy two-piece upright stake. It is compact to carry and easily assembled. The NEW Original campfire grill has a raised edge to prevent food falling into the fire; and like the other grills it is easy to dismantle and clean once you’ve finished cooking.